The government of Ontario recently released its draft strategy for agricultural soil conservation. New Horizons outlines a framework for managing soil health from 2018 to 2030, and includes specific research and action plans. The Ecological Farmers’ Association of Ontario has also responded and the Organic Council of Ontario shares many of their concerns. The Organic Council of Ontario appreciates the work undertaken in developing Ontario’s Draft Soil Health and Conservation Strategy. We were encouraged by the government’s seriousness in maintaining soil health, particularly in an era of growing ecological uncertainty brought about by climate change. However, we do have concerns over specific issues that remain unclear or unaddressed in this strategy. Many of these concerns can be addressed through an emphasis on organic production practices and techniques, which are absent from the document. Overall, the draft strategy extends beyond connecting soil health to greater and better crop yields. It links healthy soil to better water quality, reduced greenhouse gas emissions, improved resistance to the effects of climate change, and, by encouraging the growth of beneficial soil organisms, biodiversity and a generally healthier ecosystem. However, the strategy lacks a clear, systemic approach to soil conservation that outlines goals beyond farm-scale production and areas for further research across the agri-food sector. The report recommends that farmers meet targets of at least three crop families in a rotation (based on an annual system), but does not address possible benefits of longer durations with perennials. The report rightly identifies the need to increase the use of organic amendments (such as manure or compost), but lacks more specific goals and methods for increasing the use of amendments. This is particularly troubling, as the report also notes that in 2016, only 20 percent of Ontario cropland received manure. The report refers to the need to develop incentives for producers to adopt better soil management practices, but stops short of discussing how cost-sharing, grants and other programs mentioned can be tied to specific outcomes. We were encouraged to see the need for publicly available soil data addressed in the report, including reference to farmers providing their own soil test data and encouraging broader participation by different stakeholders in the process. We recommend that all soil mapping and carbon measurements occur at a one-meter depth and include an analysis of both total carbon and more stable forms such as humic and fulvic acids. We were also encouraged by the report’s reference to federal agri-environmental indicators as a means to measure soil health and conservation, with an eye towards adopting them to a more refined scale. 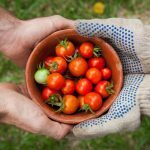 Unfortunately, the draft strategy makes no mention of organic production methods or research, and does not provide any examples of organic farmers employing any of the soil management practices outlined in the report. This is a missed opportunity to tap into the wealth of knowledge and experience that exist in the organic sector. It does a disservice to the hundreds of organic producers and processors in Ontario whose work contributes about $1.4 billion annually to the provincial economy. Research indicates, for instance, that organic production can help reduce greenhouse gas emissions by using less energy. At the same time, organic systems can also hold more carbon in the soil on average, compared with conventional ones, when measured to a depth of one meter from the surface (Cavigelli at al 2013). And recent research indicates that not all carbon held in soil is equal. Total soil carbon is a less reliable measure over time as it includes labile carbon, which has a rapid turnover time. More nuanced studies have shown that organic soils hold higher levels of humic substances, which have been tied to improved fertility and soil structure (Howe 2017). It is findings like these that can deepen connections between agricultural production and climate change mitigation strategies, while improving overall soil health. We thank the Ministry for its efforts to address the pressing need for soil conservation in Ontario. Improved data collection will indeed allow for more effective future policy responses. However, we also require an ongoing, systemic response to improving the province’s soil health. Looking to the organic sector as an example of one type of innovation would provide essential knowledge and approaches in this area. 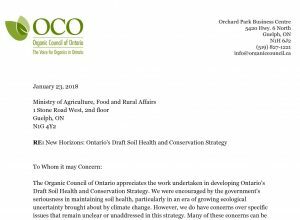 We encourage OMAFRA to continue its consultation with organic producers, and look forward to working with the Ministry as it finalizes its soil strategy.